From my paper garden today is a card I created using Susan’s Garden Notes Phalaenopsis (Moth Orchid) and Trevi Urn. Step 1 Form card base 5″ X 6″ From white Soft Finish Cardstock (The embossing folder actually determined card size as I started as a 6″ X 6″ then had to trim down) Emboss card front. Step 2 Using white Soft Finish Cardstock which has Clear Double Sided Adhesive on back cut 2 Garden Notes Trevi Urns. Adhere 1 on top of other. Color urn using alcohol markers in your choice of colors. Remove protective paper add pop dot center lower back of urn then adhere to card front keeping close to bottom to allow room for flowers at top. Step 3 From white Soft Finish Cardstock cut several Garden Notes Phalaenopsis (Moth Orchids) color with alcohol markers in color of your choice then shape using Susan’s 4 pc. All Metal Tool Set, molding pads and Leaf Pad see Susan’s video here. Cut leaves and 3 stems from green cardstock and cut 3 stems from white cardstock. Adhere white stems on top of green stems color with alcohol markers. Shade and shape leaves. Step 4 build flowers on card front using Kids Choice Glue. Step 5 Add sentiment using pop dot. Now is your turn to create – have fun! 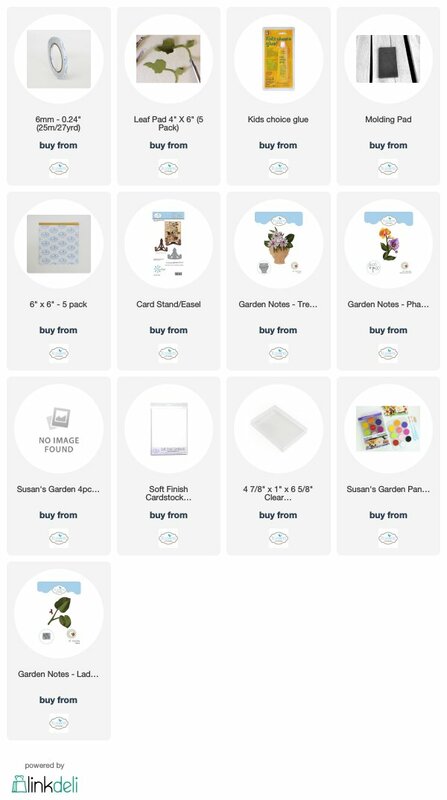 All Elizabeth Craft Designs supplies used are linked below just click on any picture it will take you directly to their site. I haven’t tried the flower but I’m wondering where you got the brick pattern. Beverly sorry it took so long to get back to you. Info on bricks is Spellbinders M-Bossabilities EL-015 it is bricks on 1 side and woodgrain on other.